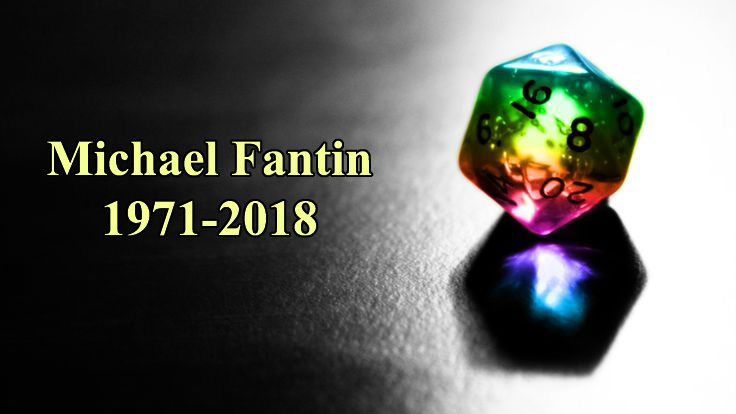 We have been shocked and grief-stricken to learn of the passing of DCC community member, and friend, Michael Fantin. We (like many others) are still processing the news. His was a smiling face that we sought out every year at Gary Con, and he made that event even more special with his being there. Michael was an always cheerful presence at the gaming table. He was a nurse and businessman who loved spending time with his grandchildren. He was the kind and thoughtful man with whom we will never again roll dice. He was more than a friend, he was a member of our tribe. We were fortunate to have met him and to call him friend. We mourn his death. Our hearts go out to those all those who knew him, his friends and family, in this difficult time. There simply are no words to cushion the pain of his loss. A modest Go Fund Me has been started to help the family with funerary expenses. You may contribute to by clicking through below. and I asked whence I should see him again. Well said guys. I never saw him without a smile and was very sad to learn he’d left us.